Fishing is an extremely popular pastime in Australia, so it only seems fit to get on board while travelling down under in a campervan hire and try your luck at some of the many fishing towns you are sure to come across. Australia is home to some of the world's best fishing spots, making it a playground for keen fishermen. Whether you are casting a line off the jetty or embarking on a chartered adventure, you are sure to enjoy an experience that can be enjoyed at any time of the day, by both those young and old. 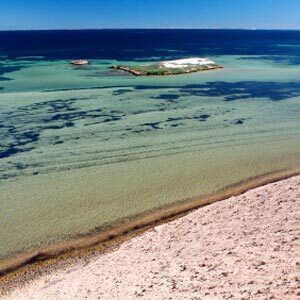 Shark Bay is one of Western Australia's most talked about fishing hot spots and with good reason. Bluebone groper, Spanish mackerel, sailfish, cobia and yellow tailed kingfish are among the many species that frequent these waters. Popular fishing spots around this area include Steep Point, False Entrance, South Passage and Dirk Hartog Island, which all offer an amazing setting to sit back, relax and let the fish do all the biting. The Windamere Dam is located in the Central Tablelands region of New South Wales and is well stocked with a wide range of fantastic fish. With the chance to catch golden perch, Murray cod and silver perch, keen fisherman will not want to pass this one up. You name it and South West Rocks has got it when it comes to fish. Varieties include Black Marlin, Spanish and Spotted Mackerel, Cobia, Dolphin Fish and Yellowfin Tuna. Fishing off the rocks is extremely popular here, while beach fishing also provides an enjoyable pastime. This growing little coastal town is ideally located near midway between Sydney and Brisbane, making it the ideal weekend escape destination. The estuaries around the East Gippsland region of Victoria provide the best opportunities for keen fishers to catch a big dusky flathead. In fact, fishermen have gone as far to haul in flatheads that weigh a whopping 12 kg from these parts. The experts suggest a medium rod to catch these whoppers, but for those who are just here for some fun and hoping to catch a little dinner, any fishing apparatus should do. The best Barramundi fishing can no doubt be found in Australia's top end; the Northern Territory. This is essentially where you will find the country's most pristine flood plains, rivers, billabongs and countless kilometers of untouched coastline. Known as Barra Country, this region is home to some of the world's best professional fishing guides, ensuring you will know the best places to cast and line and catch a whopper. Fishing is another popular pastime in New Zealand, and campervan hire Wellington is the perfect way to experience this.